The tutorial explains how to remove blank spaces in Excel using formulas and the Text Toolkit tool. You will learn how to delete leading and trailing spaces in a cell, eliminate extra spaces between words, get rid of non-breaking white space and non-printing characters. What's the biggest problem with spaces? They are often invisible to the human eye. An attentive user can occasionally catch a leading space hiding before the text or a few extra spaces between words. But there is no way to spot trailing spaces, those that keep out of sight at the end of cells. It wouldn't be much of a problem if extra spaces were just lying around, but they mess up your formulas. The point is that two cells containing the same text with and without spaces, even if it's as little as a single space character, are deemed different values. So, you may be racking your brain trying to figure out why an obviously correct formula cannot match two seemingly identical entries. Now that you are fully aware of the problem, it's time to work out a solution. There are several ways to remove spaces from string, and this tutorial will help you choose the technique best suited for your particular task and the data type you are working with. 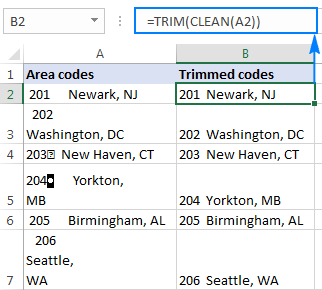 If your data set contains superfluous spaces, the Excel TRIM function can help you delete them all in one go - leading, trailing and multiple in-between spaces, except for a single space character between words. Where A2 is the cell you want to delete spaces from. 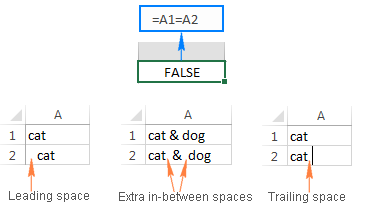 As shown in the following screenshot, the Excel TRIM formula successfully eliminated all spaces before and after the text as well as consecutive spaces in the middle of a string. And now, you only need to replace values in the original column with trimmed values. The easiest way to do this is using Paste Special > Values, the detailed instructions can be found here: How to copy values in Excel. When you import data from external sources, it's not only extra spaces that come along, but also various non-printing characters like carriage return, line feed, vertical or horizontal tab, etc. The TRIM function can get rid of white spaces, but it cannot eliminate non-printing characters. Technically, Excel TRIM is designed to only delete value 32 in the 7-bit ASCII system, which is the space character. To remove spaces and non-printing characters in a string, use TRIM in combination with the CLEAN function. As its names suggests, CLEAN is purposed for cleaning data, and it can delete any and all of the first 32 non-printing characters in the in the 7-bit ASCII set (values 0 through 31) including line break (value 10). 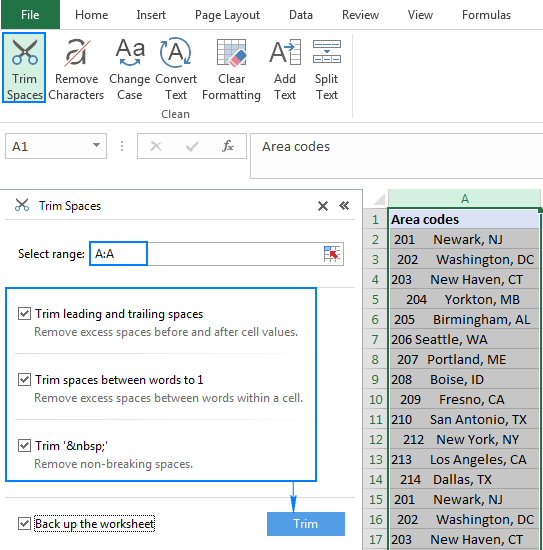 Utilize the "Replace All" feature of Excel: in the "Find what" box, input a carriage return by pressing the Ctrl+J shortcut; and in the "Replace with" box, type a space. Clicking the Replace All button will swap all line breaks in the selected range for spaces. For more information, please see How to remove carriage returns (line breaks) in Excel. If after using the TRIM & CLEAN formula some stubborn spaces are still there, most likely you copy/pasted the data from somewhere and a few non-breaking spaces sneaked in. A non-breaking character has value 160 in the 7-bit ASCII system, so you can define it by using the CHAR(160) formula. The SUBSTITUTE function is used to turn non-breaking spaces into regular spaces. And finally, you embed the SUBSTITUTE statement into the TRIM function to remove the converted spaces. If the liaison of 3 functions discussed in the above example (TRIM, CLEAN and SUBSTITUTE) was not able to eliminate spaces or non-printing characters in your sheet, it means those characters have ASCII values other than 0 to 32 (non-printing characters) or 160 (non-breaking space). In this case, use the CODE function to identify the character value, and then employ SUBSTITUTE to replace it with a regular space and TRIM to remove the space. The CODE function returns value 127 (please see the screenshot below). In some situations, you may want to remove absolutely all white spaces in a cell, including single spaces between words or numbers. For example, when you have imported a numeric column where spaces are used as thousands separators, which makes it easier to read big numbers, but prevents your formulas from calculating. After that, replace formulas with values and your numbers will calculate properly. Before removing spaces from a certain cell, you may be curious to know how many of them are actually there. Subtract the "space-free" string length from the total length. Now that you know how many spaces each cell contains, you can safely delete extra spaces using the TRIM formula. As you already know, many extra spaces and other unwelcome characters can lurk unnoticed in your sheets, especially if you import your data from external sources. You also know how to delete spaces in Excel by using an appropriate formula. Of course, learning a handful of formulas is a good exercise to sharpen your Excel skills, but it might be time-consuming. Those Excel users who value their time and appreciate convenience can take advantage of our Text Toolkit for Excel, a time saving-tool that allows removing spaces and non-printing characters in a button click. Once installed, the Text Toolkit adds several useful buttons to your Excel ribbon such as Trim Spaces, Remove Characters, Convert Text, Clear Formatting, and a few more. Select the cells (range, entire column or row) where you want to delete extra spaces. Click the Trim Spaces button on the ribbon. Done! All extra spaces are deleted in a single click. If you are curious to explore other capabilities of this handy add-in, you are most welcome to download a 15-day evaluation version. If you like the tool and decide to get a license of the Text Toolkit or the entire Ultimate Suite for Excel, we are happy to offer you the 15% coupon code: AB14-BlogSpo. This is how you can quickly remove spaces in Excel cells. I thank you for reading and look forward to seeing you on our blog next week! 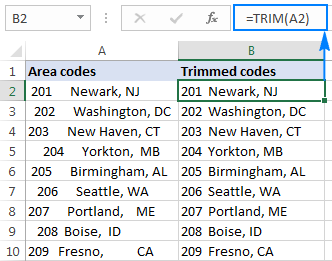 22 Responses to "How to remove spaces in Excel - leading, trailing, non-breaking"
Thanks for posting about "TRIM" function. However I do have an excel having values with leading spaces. When used both Trim and Value(Trim) functions its not working. The leading space is still exists. I want to space in the All names. Please tell me formula n any path. Have you tried using regular expression in excel vba? Thanks Svetlana - my bugbear was the nbsp space which I didnt realise...yours was only article which addressed it. Many thanks indeed! => I wanted to remove space between 'Table of Contents' & 'Asia-Pacific' in all row in excel sheet. can u pls sugg me the formula. Thanks for your sharing a good concept. Thanks a lot for sharing the various possibilities in Trim function. It helped me to understand in detail. I have data in a column and wouldn't like to use a helper column. In this case how could remove spaces in a column in one go? This was very helpful. The step by step suggestion actually resolved my challenges. Thank you. This is an outstanding resource! Thanks so much for your help, Svetlana! thanks for your precious post. Get the space character in another cell using LEFT(cell,1) or whatever gets the trailing or leading character. Copy the cell and paste into the replace dialog (CTRL H) "Find what" box. Leave the "Replace with" blank then change all. Hello, So I have a COUNTA formula running, but it counts a cell even if people accidentally press a space. Is there a way to prevent it from counting those spaces? Can you use COUNTIF or COUNTIFS instead of COUNTA? COUNTIF and COUNTIFS and SUMPRODUCT is more flexible than COUNTA. Hey Doug, thanks for responding. Unfortunately, I don't have a criteria to use for the COUNTIF. Basically, we are scanning serial number and there is no single criteria. I would have to use multiple criteria and I'm sure it'll slow down the document especially since I'm going to use it on 365 with multiple users. Use the COUNTA (range) - (COUNTA (range)-COUNTIF(Range," ")) which will count the cells that have just a space. Stunning Formulas. looking forward to get more infor. Fabulous reference article! 'nuff said! Extremely helpful!! Thanks, I needed the Code step to figure out the HTML character that was being copied in with my data. All the steps were great! I have a range of cells (in Excel 2011) in columns with text. Some cells start with a space before the text. I need to color (conditional formatting) the cells that start with 1 space (just 1, if there are more than 1 spaces before the text nothing should happen). Tried lot of formulas, didn't succeed to find the right one.